It is really easy to follow the Trim Healthy Mama plan without buying a bunch of special ingredients. I shared a few lists of easy meal ideas - breakfast, lunch, dinner, and snacks. But... if you want something sweet then you will have to look into purchasing a few of those new ingredients. Luckily, many grocery stores now carry some of those sweeteners, so it is possible to make some great new desserts. The first few things you'll want to purchase (these are affiliate links -->) - stevia (get a pure extract with no additional fillers) and a granulated sweetener (xylitol, erythritol, or Truvia are good choices). And, when you begin your adventures with sugar and grain free desserts, I really think it's best to start with non-baked good items (like cookies and cakes). I've had a lot of flops learning about cooking with almond and coconut flours. It can get expensive! But I've had really good success with other kinds of desserts - custards and chocolates. Today I'm sharing one of my new favorites. 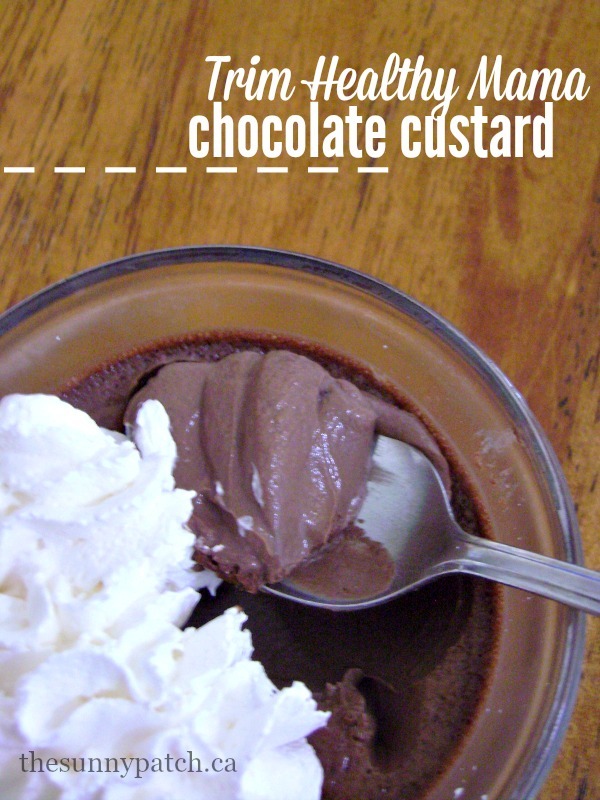 This is a rich, dark French style custard called pot de crème. It's made with basic ingredients but tastes so good. And, it is the perfect dessert to make if you have some leftover egg yolks on hand after using those whites for your Trim Healthy Mama "E" breakfast. It does take a bit of work - you'll need to bake the custard in a water bath. But it's definitely worth the effort! And, when you're enjoying a nice "S" dinner you can finish your meal with this decadent dessert (don't forget the whipped cream!). Whisk the egg yolks, sweetener, and cocoa powder in a large 4-cup measuring cup. Bring the heavy cream and almond milk to a simmer in a small saucepan, stirring often. Add the 2 oz. chocolate to the simmering milk and whisk until melted. Slowly whisk the hot milk mixture into the egg yolk mixture, a 1/2 cup at a time until it's all mixed in. Pour the mixture into six 4-ounce cups or ramekins. Seal each with a small piece of aluminum foil. Bake in a water bath until set but still quivery in the center, 35-45 minutes. Don't overcook. Remove custards from water bath and allow to cool 30 minutes before refrigerating. Refrigerate at least 2 hours. Serve with a dollop of whipped cream. For the sweetener: I like to use xylitol with a scoop of stevia blended in a coffee grinder to a powder. This ensures a smooth texture to the finished custard. This is an "S" option for Trim Healthy Mamas. Recipe adapted from The Joy of Cooking.